This recipe uses panko breadcrumbs and sesame seeds to give chicken schnitzel an extra crispy coating. Matched with a lemon mayonnaise sauce, it is sure to be a favourite. Flatten chicken steaks until approximately 1cm thickness. Dust in combined flour, salt and pepper. Combine HELLMANN'S Real Mayonnaise with water. Dip each piece of chicken into the mayonnaise then coat in combined panko crumbs and sesame seeds. Cover and refrigerate for 15 minutes. Shallow or deep fry the schnitzels until golden and cooked through. Drain. Combine extra HELLMANN'S Real Mayonnaise with KNORR Chinese Lemon Sauce GF. 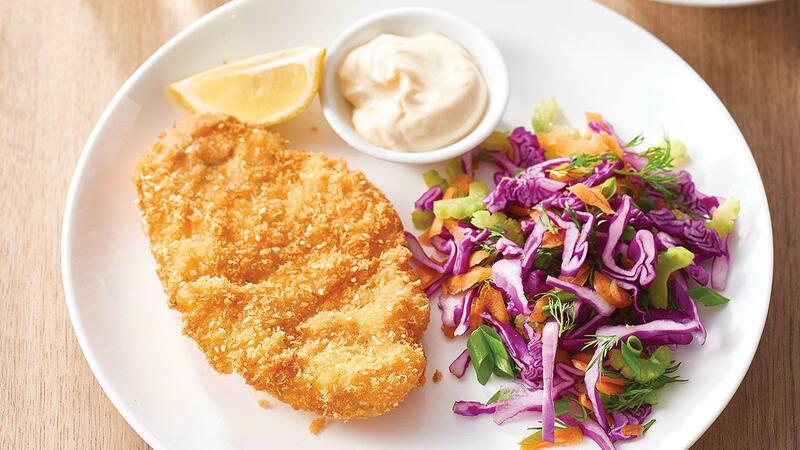 Serve chicken schnitzel with lemon mayo and chips with steamed vegetables or salad. Rather than frying, spray the schnitzels with cooking oil spray and oven bake at high heat until golden.